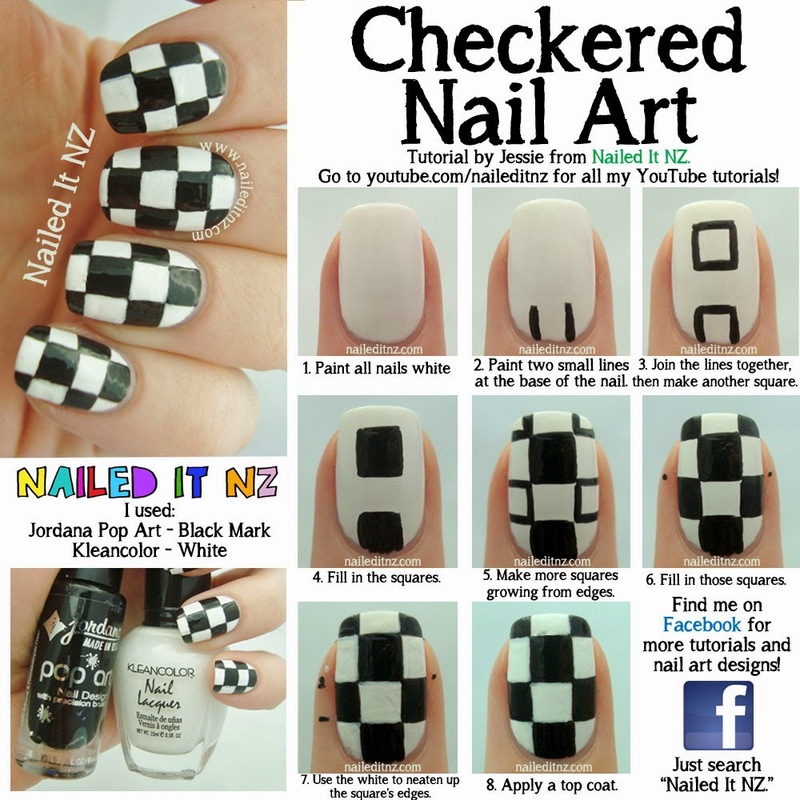 Checkered Nail Art Tutorial + BPS Clothing Review! Big post today! 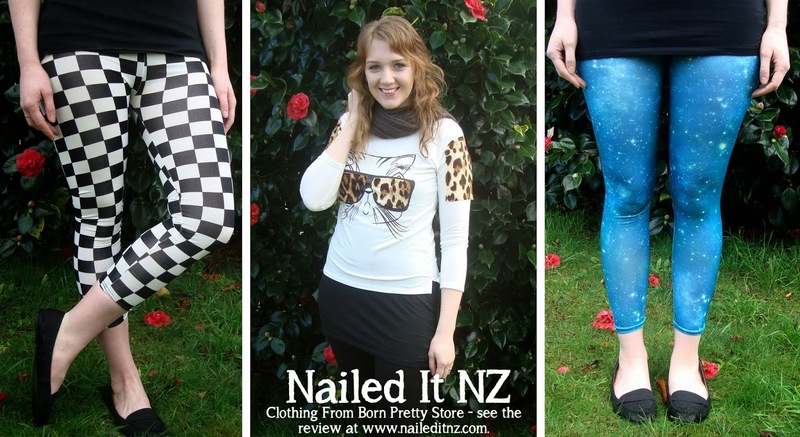 I had some clothes to review from Born Pretty Store and thought the pattern on a pair of leggings would look amazing on my nails! I was really happy with how it turned out, so I decided to make a quick picture tutorial out of it. These are always very popular, and I feel bad that I haven't done one in so long... YouTube normally takes priority! Here's the nail design I came up with. Checkers are great. I haven't done them enough because I hadn't figured out a way to get them "right." You know? There's the easy way where you just draw horizontal and vertical lines and colour in the squares, but then it's not right, the edges don't match up where checkers are meant to and it's just so irritating to a perfectionist like me! I'm so glad I found a way to do it that wasn't too difficult. Here are some of the clothes I'm reviewing today. 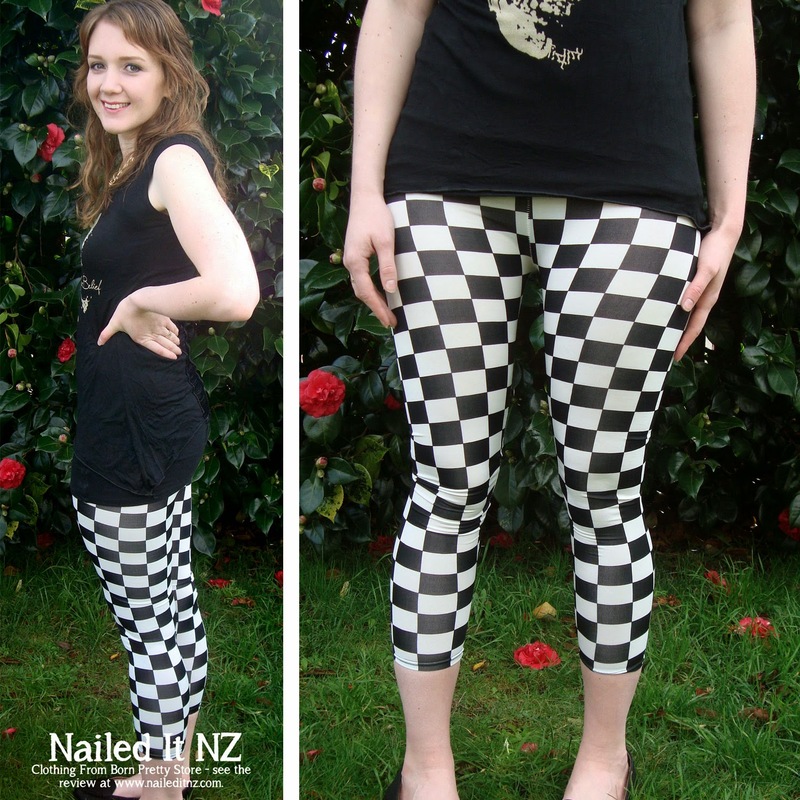 On the left are the checkered leggings that inspired the nail art, and in the middle is a pretty funky cat top. I paired that first with the leggings and spent 10 minutes laughing at the mirror because I looked like a 14 year old hipster kid. Separate, though, I like them. On the right are some more leggings - galaxy themed! There's also another top, which you'll see further down. All right, to the tutorial! The main thing I wanted to achieve for checkered nails was for only the tips of the edges to match up (see an example here) and therefore to end up with an even, crisp design. Hope you like it! 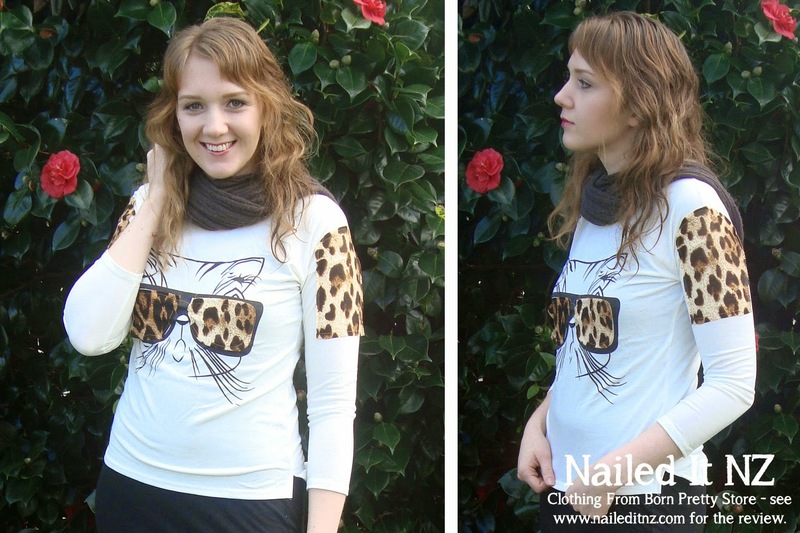 Note: feel free to share this tutorial around but please credit it to www.naileditnz.com and NEVER edit or crop it. Thanks! I find doing those two squares first provides a good starting point for your design. If you get them right, the rest is likely to fall in place. Be careful when applying your top coat - make sure you use enough and only do three strokes so it doesn't ruin the design! You can find the rest of my tutorials here. I have a heap. And subscribe! Subscribing is definitely a good thing. More photos of the nails will be at the bottom of this post; time for the review! I was happy enough with everything I received from Born Pretty Store, especially the checkered leggings! In saying that, I wouldn't pay a lot for some of it, if I actually purchased it in town. The quality of one of the tops is quite low, but still wearable. More details to follow. 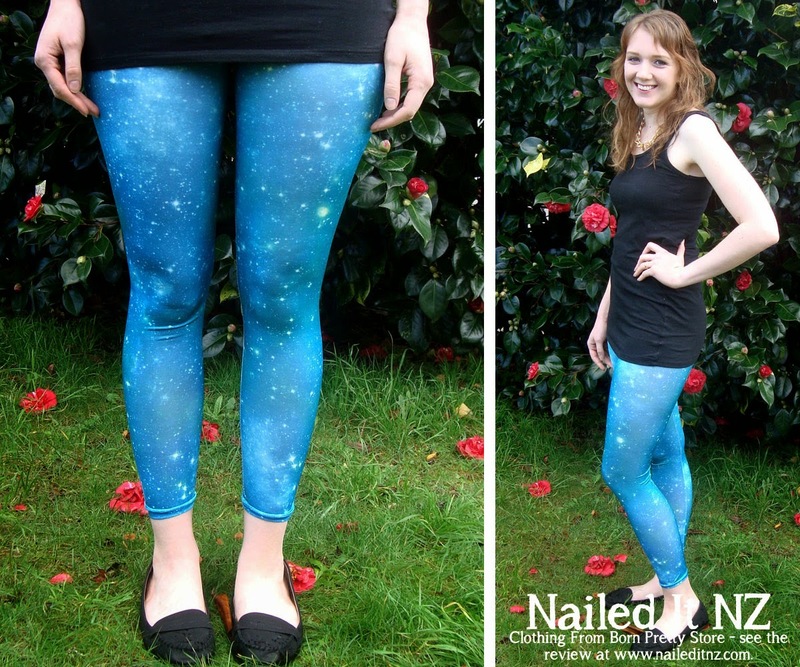 First up we have these galaxy leggings. It was a bit frustrating ordering these, to be honest, as most of the designs I wanted were out of stock. I think if I was ordering as a customer they would be available, but as I'm a blogger they couldn't wait for all the factories to send the right stuff in. I initially wanted #880, but it wasn't available so I ended up with #883. They have SO MANY OPTIONS! It's actually insane. If you love bright leggings check out this page here. I kind of want them all. They're on sale at the moment for $8.99, down from $11.89. I think that price is pretty fair. Not outrageously cheap but not too expensive either. The product is pretty good, although HA, I'm just going to pretend they're meant to be 3/4 length! I'm 5'8," and I always have problems with pants being too short. These leggings are made up of a stretchy, latex-like material that is a bit of a mission to put on - much more like stockings than my cotton leggings that I got from Kmart are! They would look better if you were a little smaller and shorter than me, they stretch a bit too much over my thighs. Still, they're kind of cool! I'd love to team them with a little black dress and some bright jewellery. You can buy these leggings here. These next leggings I really liked - the stretching-over-the-thighs thing wasn't so bad (even though they're the same size) and I mean, there are checkers on my legs, how could this NOT be amazing? Again, very short for me so bear that in mind if you're over 5'5", or you've got long legs and a short torso like me. These are cheaper than the galaxy ones, too! Currently on special for $7.64, down from $8.99. Buy them here. Next we have this slightly hilarious top! When I first pulled it out of the package I laughed and told my husband "it's just a plain white top with a logo and some bits of material stuck on to it!" And it is. But good God, the logo and material are pretty cool! It definitely grew on me. It's not fantastic material or anything, and I think it'll work it's way to my PJ draw, but I don't see myself throwing it out for a long while. It's grumpy cat turned groo-vay. Buy it for $9.99 (on sale, normally it's $16.26) here. I wouldn't pay more than $10 for it though, as I said, the quality leaves something to be desired. But still so cool! Lastly, here are some shocking pictures of the other top I was sent. Not good photos at all. Not flattering. 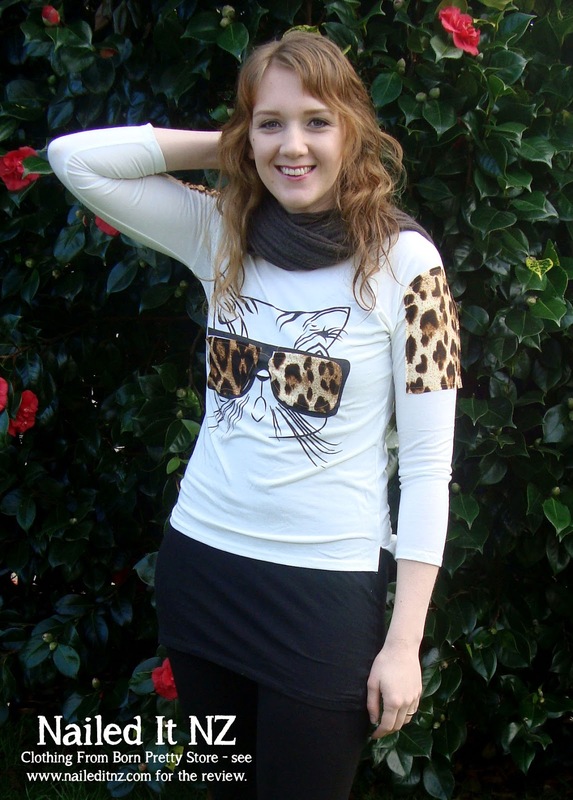 Do you know how awkward it is to model clothing? SO awkward. I don't know what to do with my hands and have to delete half the photos because I start doing stupid poses. Anyway, this top is cool, I like it. It's better quality than the one above and it's got quite a cool back - something I didn't make the most of as I was wearing a long top underneath (leggings-not-pants was chanting in my head). And skulls! Skulls are kind of cool, right? I like painting them on my nails a lot, although sugar skulls are more my cup of tea. You can buy this top here for $7.99 (down from $9.99). Before I forget, as this is the same store I get most of my nail art stuff from you can also use my discount there - type in CEL91 for 10% off your purchase. It adds up! And yes, free shipping! WOO! I can completely 100% vouch for this store too, I couldn't count how many times I've bought from them and while it can take ages to arrive sometimes, it always does in the end. Right, review done! More nail art pictures now, just to finish up this post. Hope you guys enjoyed reading this; leave me a comment and let me know what you think of this design and the clothes! Love the checkered nail art! Nice review on their clothing too. How To Use Nail Foils | Easy and Unique!